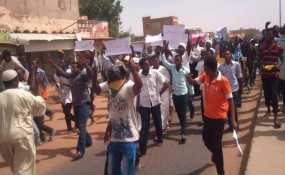 Sudan — The parties under the Sudan Revolutionary Front (SRF), led by Minni Minawi and Malik Agar, have announced to hold a meeting to make amendments to the constitution of the front of rebel movements. A joint statement signed by Minawi (SRF chairman and leader of the rebel SLM-MM) and Malik Agar (leader of the SPLM-N faction) said that the announcement followed discussion and a review of previous experiences. "Whether positive or negative, and in victory of the will of the overwhelming Sudanese revolution and the aspirations of the marginalised, the two factions agreed to unify and merge into a unified organisational structure". The parties will hold a meeting within a month, also to authorise a new leadership structure and identify tasks. The statement declared its adherence to the option of a commitment to halt and renew hostilities with the Sudanese government forces in order for humanitarian activities to temporarily operate in areas of conflict, "until a just and comprehensive peace has been achieved". Responding to the current uprising in Sudan, the SRF statement said that "it will pave the way towards achieving a just and comprehensive peace that addresses the roots of the Sudanese problem and the specificities of the conflict zones". Jibril Ibrahim, head of the Justice and Equality Movement (JEM) and Minawi were due to discuss the resumption of negotiations with the Sudanese government in Doha last month. This was going to be the next step after all parties signed a pre-negotiation agreement on December 6, 2018. The rebels, however, refused to sit down with Al Bashir in Doha, acting in solidarity with nationwide protests calling for president Al Bashir to step down from power.